What is "the Real?" I have been asking myself that question quite a lot recently. The only answer that I can come up with that makes any sense is: everything. Every object, idea, dream, shadow and piece of code is part of our reality. For as long as I can remember Virtual Reality has been the future product of computer science. From Tron to The Matrix and Existenz a new environment is created out of and embedded in a previous one. "Land on Demand" now exists and for those under the age of twenty have always existed, there is no understanding how IM fits, it is just part of life... Real life. So what does this mean? It means that the worlds formerly known as virtual are ripe for an inundation of the mundane... the notaries, accountants, door to door salesman and Tupperware parties. These worlds are creating an area of common experience where none existed. 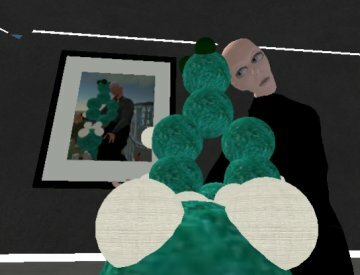 When two avatars are in the same space it forms a place that shares face to face communication for people who may be located anywhere in the world. This shared space allows us to form closer, more personal, connections and encourages our interaction through reference to the shared experience. We are provided with a means to be our idealized self, at least to those who see us and to hide those things which we may like least about ourselves. It means that once again no one knows that you are a dog. The work in this show is all real, some more so than others, but whether the basis is code or photographs this work reflects the new reality and the hand holding the mirror is the avatar of the viewer. Enjoy the show; take "home" one of Neural Blankes' pens and think about what it means. The "Pen" is an object of pure art in an environment where there is nothing to write. The work by these artists is rooted in the simulation, most rely directly on code for some function. All function visually and occasionally there is an extension beyond that. Maxmiliano Henrique Barbosa provides a window into the concept of the environment and a way back from it. His work speaks of displacement and connection and hearkens us back to the world around us. His work is reminiscent of the screen that is used to enter the computer generated environment. DC Spensley's hyperformal canvases sketch a world based on code, in doing so he reminds us of the numbers and commands that exist underneath our existence, his level of reality is drilled down into the intrinsic function of the machine, and in moving through his piece we experience the abstract beauty of the formula. Ethan Miller repackages language. His work provides a hyper-awareness of our words and processes them through code and then on a deeper level into imagery. Ethan's work is about translation and visualization. Sasun Steinbeck's window into the world is twisted and in flux, she wants us to look and to feel free to touch. We are invited to interact and in doing so change the work in interesting and sometimes surprising ways. Her work is particularly native to the environment. Thomas Asmuth provides us with an opportunity to interact with a chemical in a way otherwise impossible, his model of the cuddly happy Prozac(tm) molecule provides comfort to the avatar in ways that a chemical molecule cannot in the rendered environment. 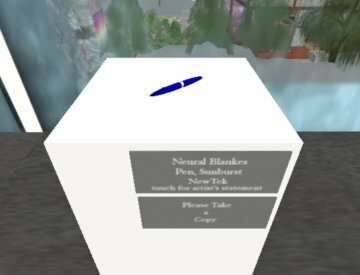 Neural Blankes brings us the humble pen, and models it perfectly. This work has been chosen as a symbol for the show in that it talks about both the rendered environment and the world outside the computer. Viewers are also invited to take home a copy as a souvenir of the show. "The Real" was curated by James Morgan, and juried by Aaron Siegel and Michael Weisert. Ars Virtua would like to thank the following for support and encouragement in this its first endeavor: The CADRE Laboratory for New Media, SWITCH, Thn Doctorow, Jeremy Kabumpo, Fiend Ludwig, Lynnix Muse, Jim Nolan, Servo Quatro, Rubaiyat Shatner, commonpeople Shatner, Vroom Stilman MichaelJohn Turner, Humbert Xinjan. The architecture of Ars Virtua is by Aaron Siegel and Lynnix Muse, and the furniture in the lounge is by Neural Blankes.